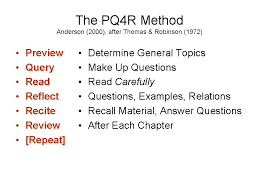 The PQ4R method is a method that individuals can use to help them better comprehend written material. It helps individuals focus on orgainizing information in their minds and making it meaningful (Slavin,1994). a. PREVIEW - scan the material to get an idea of the main points; look at headings to see what you are going to be learning; try to figure out what you're going to be reading. b. QUESTION - ask yourself questions as you read; turn headings into questions and make sure you can answer them; ask the typical "reporter" questions of who/what/when/where/how and the 4R words. c. READ - read the material carefully; if you asked questions about a section, make sure you find the answer when you read. d. REFLECT - think about what you have just read. Try to make it meaningful by relating it to something you already know, relating the different sections to each other, trying to understand parts that seem to contradict each other, using the information you read to solve a problem, or thinking about how what you read affects your life. e. RECITE - practice what you have learned by repeating major points out loud; this helps you to remember the information longer. While Anastasia (2007) stated that PQ4R is a popular method of working with text to remember it better. After seeing about PQ4R above, we can say that it is a method which is used to comprehend and to remember the text easily. b. To help non-disabled students improve reading comprehension and retention. c. To understand what they read and to remember details of what they've read. d. To improve comprehension and retention, which can lead to better grades and improved achievement in all school subject areas. Belum ada tanggapan untuk "PREVIEW, QUESTION, READ, REFLECT, RECITE AND RIVIEW (PQ4R) USING IN READING SKILL"